THE VATICAN — President Donald Trump's first overseas foreign trip as president has finally brought him to the Vatican, where he came face-to-face with Pope Francis. This world religion trip has had it all: kings in the Islamic world, a prime minister in Israel, and now the Pope in Rome. Today, as Pope Francis greeted President Trump with a warm "Welcome," Trump responded, "Thank you very much. It's a great honor." It has been a religious whirlwind for a president whose goal is to root out terrorism by rallying the three major religions in a bid for peace. The Pope's gift to President Trump was in that vein – a sculpted olive tree, symbolizing peace. "We could use some peace," Trump said. The Pope also gave the president a few books to read, including The Joy of the Gospel, which talks about having a personal relationship with Jesus, along with fighting for social justice around the world. CBN News has had an up-close view of the events unfolding on the president's trip. We were part of a select group of press who came to the Vatican to witness a bit of history. Senior administration officials tell CBN News the world religion tour intentionally included the Vatican, to help reset Trump's relationship with the Pope. It got a bit testy during the presidential campaign. The POTUS/Pope spat goes back to when the Pontiff took issue with candidate Trump's insistence on building a "big beautiful border wall." Pope Francis said someone who thinks about building walls and not bridges is not a Christian. And Trump fired back. "For a religious leader to question a person's faith is disgraceful," Trump had charged. "I am proud to be a Christian and as president I will not allow Christianity to be consistently attacked and weakened… [The Mexican government is] using the pope as a pawn and they should be ashamed of themselves for doing so, especially when so many lives are involved and when illegal immigration is so rampant." "A person who says 'no walls, but bridges,' and the other who says 'walls, not bridges,' is something which you cannot reconcile," Italian newspaper columnist Massimo Franco said. Nina Shea, with the Hudson Institute, tells CBN News the president's visit to the Vatican is an opportunity to mend fences. "Certainly the Pope is leader of a church that has millions of followers," Shea said. "It's important that he make peace with Pope Francis and vice/versa." There are stark contrasts between the two leaders. They don't see eye-to-eye on immigration, climate change, or dealing with Syrian refugees. They do agree on stopping religious persecution and combating human trafficking. There are plenty of important issues in a world that just gets darker by the day. The president believes the world's three major religions can have a big say in the outcome. Trump's visit to Rome came right after he wrapped up a whirlwind tour of Israel, where he called for peace between the Jewish state and her Palestinian neighbors. Speaking at the Israel Museum in Jerusalem, Trump sounded optimistic as he declared his belief that both sides were eager to move forward in the peace process. "We know that peace is possible if we put aside the pain and disagreements of the past," the president said. "As I have repeatedly said, I am personally committed to helping Israelis and Palestinians achieve a peace agreement, and I had a meeting this morning with President Mahmoud Abbas and I can tell you that the Palestinians are ready to reach for peace – and, from my meeting with my friend Benjamin Netanyahu, I can tell you Israelis are ready to reach for peace as well," he continued. "Making peace will not be easy," he acknowledged. "We all know that. Both sides will face tough decisions. But with determination, compromise, and the belief that peace is possible, Israelis and Palestinians can make a deal." 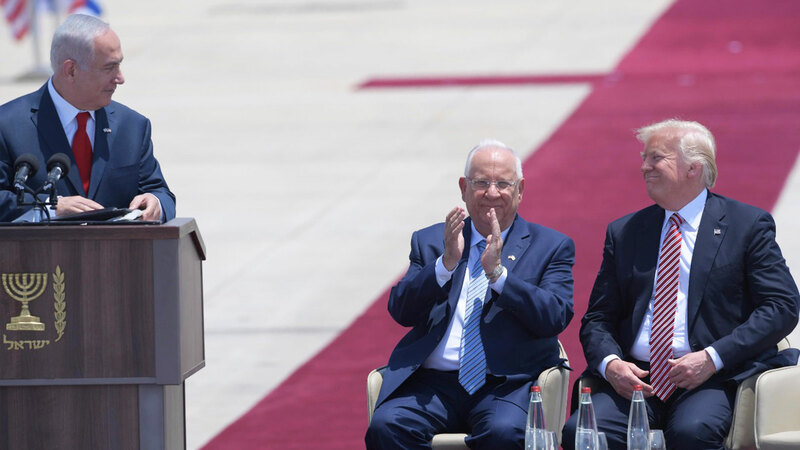 Addressing his "good friend" Israeli Prime Minister Benjamin Netanyahu, the president reiterated his commitment to stand with the Jewish state. "I stand in awe of the accomplishments of the Jewish people, and I make this promise to you: My administration will always stand with Israel," he pledged. "Through your hardships, you have created one of the most abundant lands in the world. A land that is rich not only in history, culture, and opportunity, but especially in spirit. Netanyahu for his part thanked the U.S. president for a speech "that in so few words said so much." 'Peace in the Middle East,' how many times have we heard that before? But will things be different now that President Trump is on the scene? The peace process has never seen anything quite like him. Before Trump was president, he was known as one of the best deal makers in the entire world. Well, now he's come to Israel, hoping for what he calls "the ultimate deal" – peace between Israelis and the Palestinians. In a speech Tuesday at the Israel Museum in Jerusalem, he assured the Jewish state that he is "personally committed" to making that a reality. "Palestinians are ready to reach for peace," Trump said. "Benjamin Netanyahu wants peace." Striking a Mideast peace deal, however, is not going to be an easy task. There are plenty of stumbling blocks ahead. But one thing is for sure: All roads lead to Jerusalem. The ultimate stumbling block in any sort of two-state solution: The fact that both Palestinians and Israelis see Jerusalem as their capital. The official U.S. policy is that it's disputed territory, but as a candidate, Trump told CBN News he was ready to move the U.S. Embassy from Tel Aviv to Jerusalem. "Well I am for that 100 percent. We are for that 100 percent," candidate Trump told us in an interview on the campaign trail at Liberty University. But things are different now that Trump is president. He's dialing it back. He told us in an interview after becoming president, "Well, there is certainly a chance of it. Absolutely. But we are going to be — we are doing very detailed studies on that and it will come out very soon. I hate to do that because that is not usually me, studies," he said, adding, "But this has two sides to it. It's not easy." That's because a provocative step like moving the embassy to Jerusalem may disrupt the peace process before it gets going. So, Trump's trip to the Mideast came without an embassy announcement. That has been disappointing to many Israelis. Trump did make history, though. He became the first sitting U.S. president to come to Israel and visit the Western Wall in Jerusalem. Some see that as acceptance – as the United States' acceptance – of Jerusalem. But some members of the Trump administration won't say the wall is part of Israel. It's all part of a very sensitive process. "It's not easy. I've heard it's one of the toughest deals of all. But I have a feeling that we're going to get there eventually. I hope," President Trump said. "I do look forward our discussions, which I think are peppered with possibility," said Israeli Prime Minister Benjamin Netanyahu. There is hope, and it comes from an unlikely customer: Iran. The administration believes additional Arab nations, like Saudi Arabia, will be willing to work more closely with Israel and stand together against a common enemy, thus advancing the peace process. CBN News talked with Walid Phares, a former foreign policy advisor on the Trump presidential campaign. "Definitely President Trump has the intention," Phares said. "He has the heart to it. He wants to achieve it as something big that no previous president has been able to solve, but realities are realities, not just in our politics here in the United States, but in the Middle East." President Trump knows he will have his hands full getting the Palestinians to the table to negotiate. His meeting in Bethlehem with Palestinian Authority President Mahmoud Abbas was an attempt to see what is possible. "We have no problem with Judaism. We have a problem with the occupation," Abbas said during a meeting with Trump in Bethlehem, Tuesday morning. For his part, President Trump is keeping his cards close to the vest. He hasn't signaled what a peace plan would look like or how to get there. That's an intentional move. It's part of his deal-making DNA. The question is – will that and his big personality be able to push this peace process over the finish line? Earlier Tuesday morning Trump met briefly with Abbas. While the U.S. president avoided using the term 'two-state solution,' Abbas minced no words in presenting new ideas for the resumption of peace talks with Israel. "We are keen to open the door to dialogue with our Israeli neighbors in order to create a genuine peace," the P.A. leader said. "Our problem is with the occupation and settlements and the failure of Israel to recognize the state of Palestine in the same way we recognize it. The problem is not between us and Judaism; it is between us and occupation." Following Monday's visits to the Church of the Holy Sepulchre and the Western Wall in Jerusalem's Old City, Israeli Prime Minister Benjamin Netanyahu hosted President Trump for a visit that both leaders described as exceptionally warm. After their private meeting, the men emerged and gave public comments. "We had a terrific discussion today and when I say terrific, it encompasses everything," said the prime minister. He expressed his appreciation for Trump and his strong stance on issues like getting rid of the Iran nuclear deal and combating radical terrorism, noting a major difference between Trump and former President Barack Obama. "For the first time in my lifetime, I see a real hope for change," Netanyahu remarked. Trump called Netanyahu a "great friend" and ally, though he stopped short of promising to rip up the Iran nuclear deal. He was also silent on the controversial two-state solution, which some tout as the way to bring lasting peace to the Middle East. "I've heard it's one of the toughest deals of all, but I have a feeling we'll get there eventually -- I hope," Trump said on the complexities of the Israeli-Palestinian relationship. Trump also spoke about his visit earlier in the day to one of the Jewish religion's most important sights. "I was deeply moved by my visit today to the Western Wall," he said. "It will leave an impression on me forever." Trump is first sitting U.S. president to visit the Western Wall. Donning a yarmulke, he prayed and placed a note in a crevice of the wall. Watch below. After giving their comments, Trump and Netanyahu left for a private dinner with their wives at the prime minister's residence. A Game Changer for Israel? The president's trip marks a pivotal moment for the U.S. relationship with the Jewish state and the future of negotiations between Israel and the Palestinians. 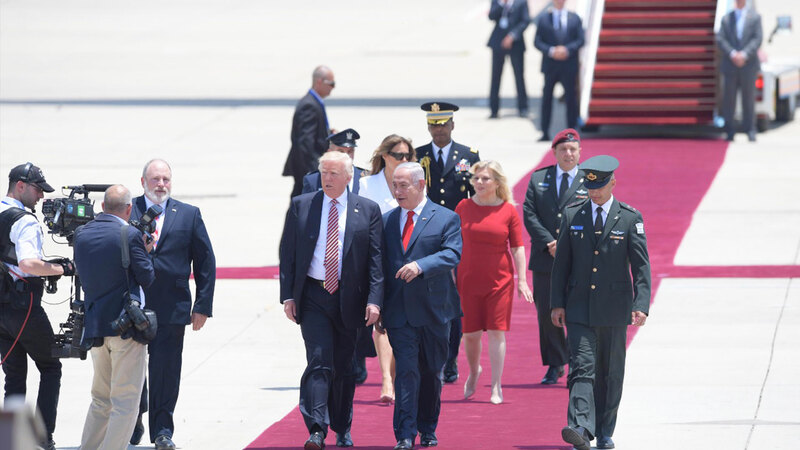 "Your visit here, Mr. President, is truly historic," Netanyahu told Trump earlier after greeting the U.S. commander in chief at Tel Aviv's Ben Gurion International Airport.. "Never before has a first trip of a president of the United States included a trip to Israel. Thank you, Mr. President." The president also took a tour of the Church of the Holy Sepulchre, which is believed to be the place of Jesus’ crucifixion, burial and resurrection. Watch below. "We love Israel. We respect Israel. And I send you the warmest greetings from your friend and ally, all of the people of the United States of America. We are with you," Trump said. 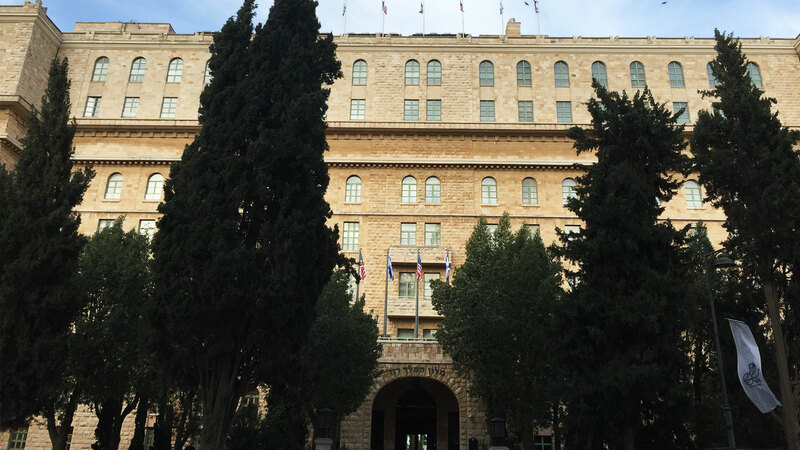 The epicenter of the 30-hour visit of President Trump is Jerusalem's historic King David Hotel. The president will be guarded by a small army of 10,000 police and soldiers. Israelis are greeting the president with a mixture of anxiety and optimism. "President Trump's coming today and we are celebrating and honoring his visit," Mike Evans told CBN News. Evans, with the Friends of Zion Museum in Jerusalem, posted signs and banners around Jerusalem to welcome the president. Evans believes the new alliance Trump forged in Saudi Arabia with the Sunni states will benefit Israel. "This is going to be a game changer for the State of Israel," Evans said. "They cannot resolve anything without Sunni cooperation. Even if it's plausible deniability, the Syrian crisis, the ISIS crisis, even the Palestinian crisis, the Sunnis are critical mass for that. He has succeeded with that." This alliance also presents a bulwark against Iran's regional ambitions. But recent statements and actions by the administration concern some Israelis. "There's no doubt about that because it is a change from the tension of the Obama administration," CBN News Senior Editor John Waage said. "But there are concerns that the administration has not been speaking with one voice [about issues] that are very important to Israelis. "One of them being the move of the [U.S.] embassy, which you have some members of the administration saying Tel Aviv is still the capital of Israel and others saying we believe Jerusalem is the capital of Israel," Waage explained. "The administration has to speak with one voice on this and right now they are not." These mixed messages are one reason a recent poll fell from 80 percent of Israelis who believed Trump was pro-Israel to 56 percent now. Yet Evans believes Trump will keep his promise. "He never promised us he'd do it in six months," Evans said. "He promised us he'd do it in his presidency." Jerusalem is also a key issue to evangelical Christians who voted overwhelmingly for Trump. "Trump may ask for patience, he may get patience. But in the end they want to see that happen and right now that's at odds with U.S. policy in the State Department," Waage said. "So Trump has some sorting out within his own administration as to whether he can truly make good on that promise." On Monday, Trump plans to visit to major religious sites in Jerusalem. First the Church of the Holy Sepulcher where many believe Jesus rose from the dead and the Western Wall below the Temple Mount where the two Jewish Temples stood. Trump met with Israeli President Reuven Rivlin and plans to meet later with Netanyahu at the Prime Minister's residence. On Tuesday, he will meet with Palestinian Authority President Mahmoud Abbas in Bethlehem. Trump says his goal is to restart peace negotiations between Israel and the Palestinian Authority.